If you have problems with video playing above, click here for secondary stream. 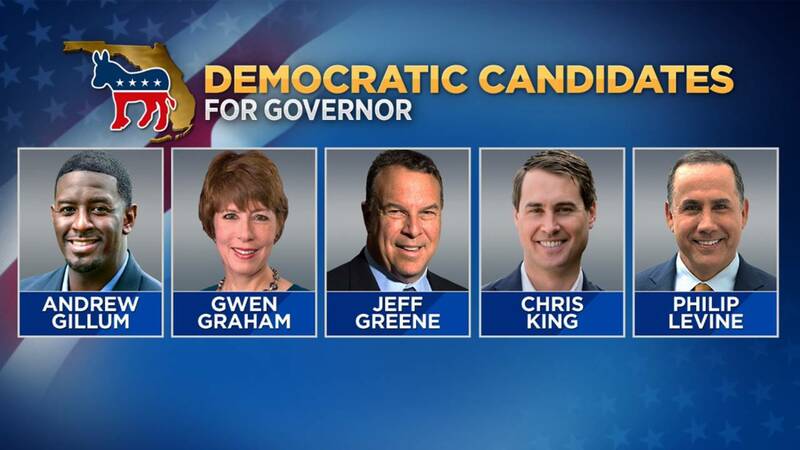 The five major Democratic candidates vying to become Florida's next governor are appearing side-by-side for possibly the last time before the Aug. 28 primary. Former U.S. Rep. Gwen Graham, former Miami Beach Mayor Philip Levine, billionaire Jeff Greene, Tallahassee Mayor Andrew Gillum and Orlando-area businessman Chris King are participating in a town hall hosted by WJXT in partnership with Jacksonville University. News4Jax Political Reporter Kent Justice is the moderator. Graham entered the town hall with an eight point advantage over Levine, according to RealClearPolitics' poll of polls. Greene trailed Levine by two points. The five candidates will take questions separately while the others are off stage.